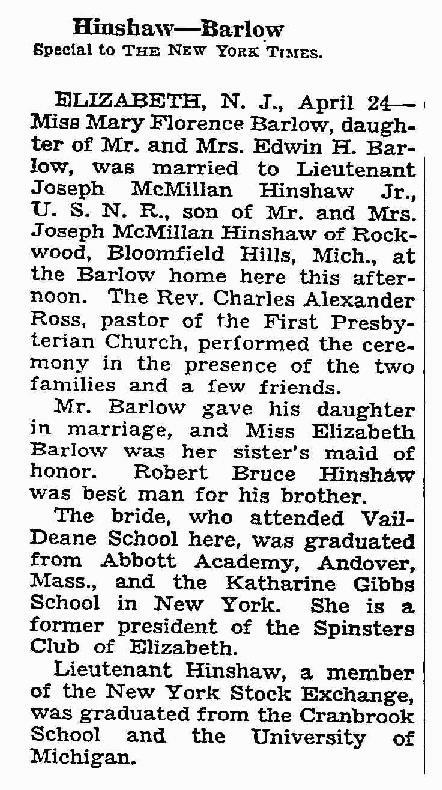 He married Mary Florence Barlow6,7,8 [Mickey Barlow1], Apr 24 19436,7,8, at her parents' home, Elizabeth, Union County, New Jersey6,7,8. 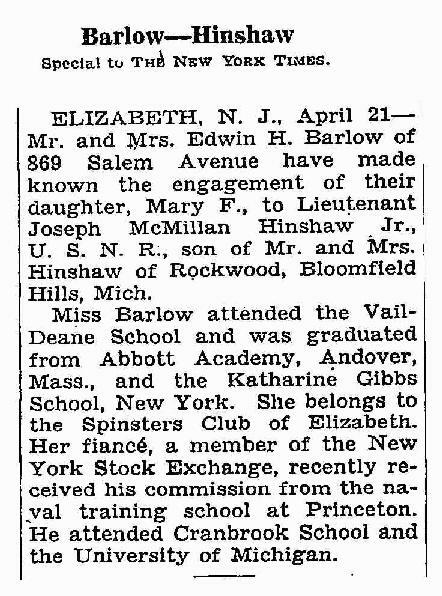 Mary, daughter of Edwin H. Barlow6,7, was born Jul 11 19176,7 [Jul 15 19175], New Jersey6,7. Joseph & Mary's engagement was announced in the "New York Times" (New York, New York) on April 22, 19437 (see scan below). Joseph & Mary's marriage was noted in the "New York Times" (New York, New York) on April 25, 19438 (see scan below). Contribution from Elizabeth Hinshaw Smylie. 1920 census, Troy Township, Oakland County, Michigan; roll T625-790, ED 205, page 17B, line #60, dwelling #396, family #402. "New York Times", Apr 22 1943; "Historical Newspapers, Birth, Marriage, & Death Announcements, 1851-2003", http://www.ancestry.com. "New York Times", Apr 25 1943; "Historical Newspapers, Birth, Marriage, & Death Announcements, 1851-2003", http://www.ancestry.com.